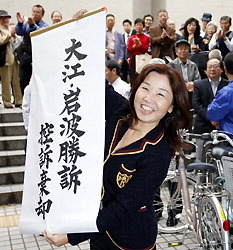 A banner showing the rejection of the appeal in the defamation lawsuit is held up as supporters of the defendants show their delight at the latest ruling in Osaka's Kita-ku on Friday.OSAKA -- The Osaka High Court has rejected an appeal in a defamation lawsuit filed against Japanese author Kenzaburo Oe and a publisher over descriptions of mass suicides in the Battle of Okinawa during World War II. A 91-year-old war veteran and the 75-year-old brother of another veteran had sought a publication suspension order and 30 million yen in damages, saying that they were defamed by false descriptions about orders for group suicides in Okinawa. But on Friday, the high court upheld a lower court ruling that dismissed their claims. The plaintiffs plan to file a Supreme Court appeal against the latest ruling. In its ruling, the high court made the first decision in Japan on the standard for suspending publications that were of high public nature or benefit and at the time of publication were true or there were sufficient grounds to deem them true. It said such publications could be suspended only if it was deemed that the information was clearly not true, the person who was defamed was continuing to suffer a great loss, and continuing to publish the material exceeded the bounds of social norms even when considering freedom of the press. Yutaka Umezawa, 91, a former commander on Okinawa's Zamami Island, and Hidekazu Akamatsu, the 75-year-old brother of a commander on another island, filed the lawsuit against Oe and publisher Iwanami Shoten in August 2005, saying that they didn't order suicides during the Battle of Okinawa. The lawsuit was sparked by publications including Oe's "Okinawa Notes." An earlier ruling said the involvement of the commanders could be sufficiently inferred and accepted, rejecting the defamation claims. In the latest ruling, Presiding Judge Koji Oda said that at the time of publication, it was common belief in academic circles that orders by commanders were given on both islands after the war. "It cannot be denied that the military was deeply involved," he said. In line with the first ruling, the court ruled that there were sufficient grounds for believing that the descriptions were true, and that the descriptions did not constitute defamation. It added that based on the evidence it could not be determined whether or not suicide orders were given by the commanders.